Silver Surfer #8-9 brigs the legend of the tormented soul of the Flying Dutchman into the Marvel Universe via the evil machinations of Mephisto. And boy, didn’t that last sentence sound like something Stan Lee would have written. At this point, Mephisto is pretty much Silver Surfer’s recurring arch nemesis. The demon lord fears the Surfer and is trying to find a way to stop him. The latest involves finding the evil spirit of the old Dutch pirate Joost van Straaten and empowering him into his new “Flying Dutchman” state. And by that, Mephisto made him into a cyborg looking a lot like Deathlok. He also has these really lame looking grappling hooks for hands. 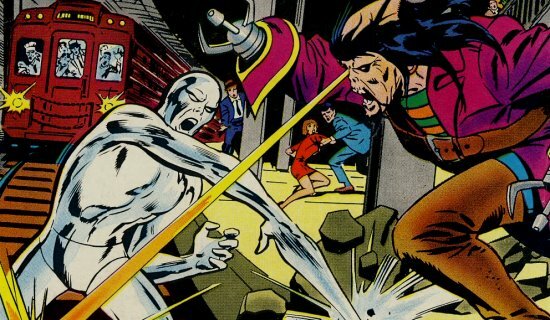 Any way they fight back and forth until the Silver Surfer is finally able to defeat the Dutchman. There’s a few really cool panels where Mephisto is getting involved unbeknownst to either the Surfer or Dutchman, but to no avail. The end of the story has the Surfer showing remorse for the Dutchman, who only teamed up with Mephisto in an attempt to free his soul. Silver’s empathy is enough to void the Dutchman’s deal and freeing him. This wasn’t the best of Lee and Buscema’s work on this title, but the story worked. They all can’t be classics I guess. This entry was posted in Uncategorized and tagged flying dutchman, john buscema, marvel, mephisto, silver surfer, stan lee by Chris. Bookmark the permalink.